Other Names: "that gang of vicious preschoolers that hangs out around 5th street"
When Milo and Rob's (understandably) irate landlord tried yet again to collect their late rent, he threatened them ominously about what would happen if they didn't pay. The landlord told Rob and Milo: "Now you two better have the money by next week, or I'll cut you up into little pieces and feed you to that gang of vicious preschoolers that hangs out around 5th Street." 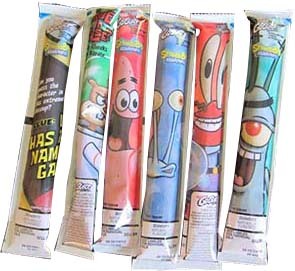 From his "hiding place" under couch cushions, Rob exclaimed with fear: "Not the 5th Street Gogurt Boys!" Clearly both the landlord and Rob were familiar with this particular gang.